This hike is one of our most strenuous here at Moreau. 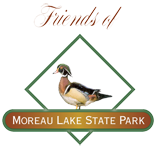 We will be hiking 0.9 miles up to the beautiful view of Moreau Lake. This is a steep hike and towards the end it gets a bit rocky. Bring plenty of water and a snack or lunch to eat at the overlook. Registration is required with 24 hours advanced notice, please call 518-793-0511. Please meet and pay at the park office, $1 for 62+ and children, $2 for everyone else.